"It's been confirmed by a source that there is a DL19 ROM. Normally updates come 2 weeks after the ROM is made which makes sense for the DL11 to come on the 26th because that is 15 days after it was made. 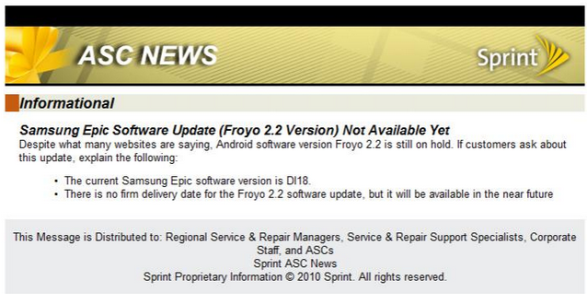 Since there is now a DL19, it doesn't look like the Samsung Epic 4G will be getting Froyo until January." Well, the rumor mill was wrong again. Anymore the only way I'll believe a ROM is going to drop is when I see it for myself on my own device. Anything else is usually all rumors, speculations, and people trying to make a name for themselves reporting things that may just be fabrications.